Note: This article uses the name “Burma,” rather than its recognized name of “Myanmar,” in order to reflect the preferences of panelists and presenters from the event. “Before we start, can everyone please move down to the front?” Sumyat Thu asked the audience at last week’s event, April 22, “Forced to Flee: Visual Stories by Refugee Youth from Burma.” She wanted the panel and presentation to feel more like a community dialogue than a lecture. Thu is a first year international graduate student at the University of Washington (UW), and an active member of the Burmese/Myanmar Student Association of UW (B/MSA). The student group’s mission is to keep Burmese students at UW connected to the larger local Burmese community, and, according to Thu’s panel introduction, “to raise awareness about cultural and political issues in Burma.” They do this through events like last month’s, which was informative, but also distinctly participatory. In addition to having people move closer, there was also an organized potluck before the official presentation during which people were encouraged to mingle and to try some Burmese dishes. The event was an extension of a project started by Erika Berg, who facilitated more than 40 visual storytelling workshops in Burmese refugee camps along the Thai border, in Delhi, and also here in Washington State. 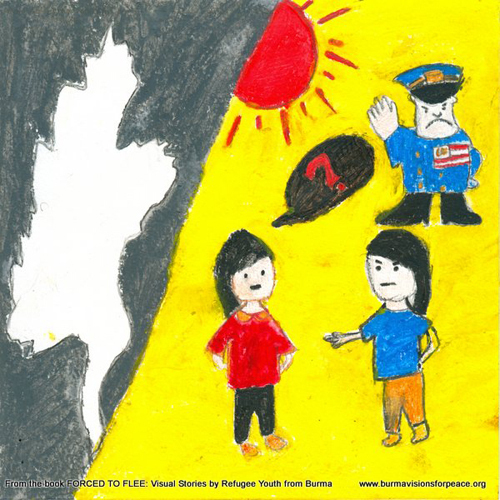 The project has culminated in a newly printed book version of Forced To Flee: Visual Stories by Refugee Youth from Burma. Berg was able to raise $15,521 through more than 100 backers on Kickstarter to fund the project. B/MSA in coordination with the Southeast Asia Center at the University of Washington hosted the event. Berg, the first speaker, explained that she was inspired to work with Burmese in refugee camps after seeing the deeply disturbing images of violence during the protests of the Saffron Revolution in 2007 and the military crackdown that followed. In the array of artwork and stories that Berg shared from workshops, some themes and experiences were pervasive. Youth artists transformed traditional national Burmese maps. Their own renderings of maps of Burma reflected the various ethnic minority states within Burma, the refugee camps along the Thai/Burmese border, or places of particular personal significance or trauma. 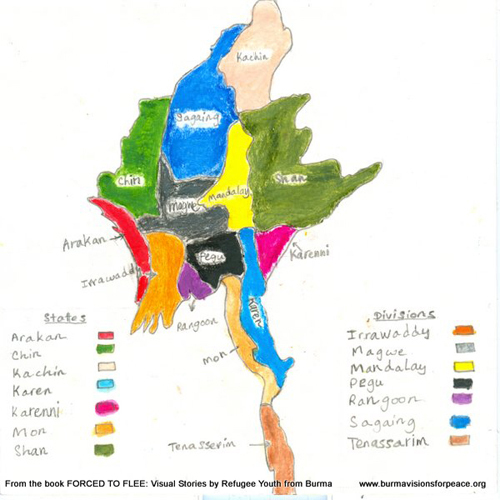 Vung It, a panelist and freshman business major at UW Bothell, drew her own map of Burma that reflects her experiences as a refugee. “I painted Burma as emptiness,” she said, pausing for a long time afterward, “because that’s how I feel about Burma.” She spoke further about the government’s “selling off” of Burma’s natural resources to foreign countries, and the hardship that follows for local people. “In our state we grow apples, but then we never get to eat them,” she explained. When asked about his dream, another panelist, Ta Kwe Say, senior Social Welfare student at UW and B/MSA president said, “to graduate.” For most young Burmese and Burmese American in Washington, educational access and success is key to achieving their goals. Many, including the panelists and UW freshman Shwe Zin, who is also a refugee from Burma, say that their goal is to return to Burma. Zin is already in the pre-med track. She hopes to follow the example of her hero, Dr. Cynthia Maung, who hosts a clinic for Burmese refugees and displaced persons, and one day to open her own clinic. Zin attended a school that “Dr. Cynthia” opened. After coming from the Tri-Cities, where she notes there were very few Burmese, Zin found a much more supportive and nourishing community at UW. Eventually, she dreams of opening up her own clinic inside of Burma’s borders. In the Q&A that followed the panel discussion, panelists often asked for input from other Burmese refugees and immigrants in the audience in answering questions about perceptions of Burma’s lingering problems, the country’s current political shifts, and supposed democratic reforms, and others. For more information visit www.burmavisionsforpeace.org. Lauren Pongan can be reached at info@nwasianweekly.com. Thank you for sharing the voices of local refugee youth, working to increase awareness of the challenges and aspirations of those forced to flee their native land.